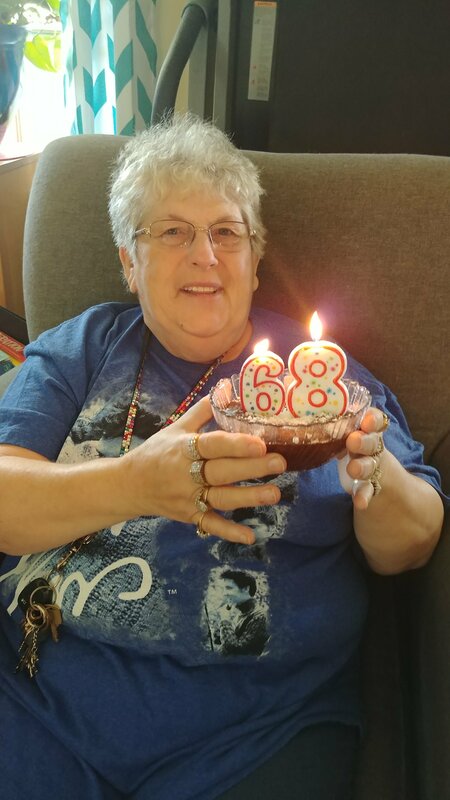 Ted’s mom, Billie, turned 68 today. She ran over for a visit and to drop off egg cartons and coupons to me. While she was here, Jake decided she couldn’t have a birthday without birthday cake, so he decided to make her a cake. He was naming random ingredients, so I told him to look up a recipe so he knew how much flour, sugar, etc that he needed. While he was doing that on his iPad, I called him to me and showed him a recipe for chocolate cake in a mug by the Pioneer Lady ( https://www.google.com/amp/www.foodnetwork.com/recipes/ree-drummond/chocolate-cake-in-a-mug-3158576.amp ). He got out everything he could reach, and I got down what he couldn’t. 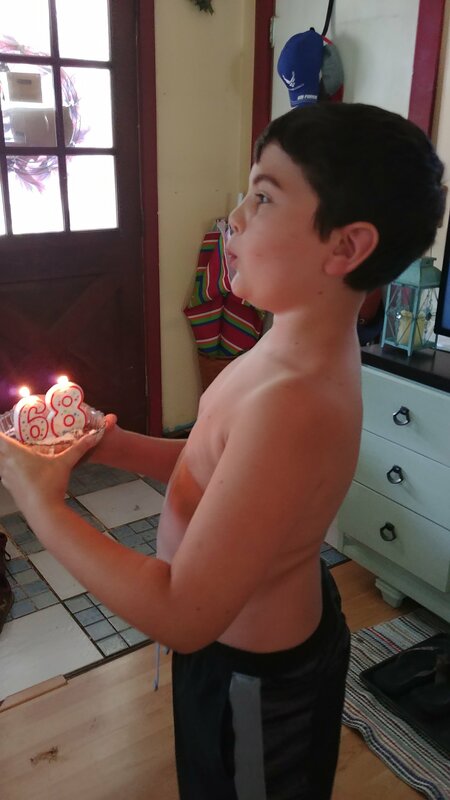 He measured almost everything himself (I poured the milk and oil since the containers were so full), and he baked it in the microwave, stuck on candles, and gave her the mini birthday cake while whistling happy birthday. Then he made himself a little cake, too, and he shared it with Grandpa Tom, Grandpa Reese, and Daddy. I could have said no to Jake because I’d just cleaned the kitchen this morning, but then we wouldn’t have this wonderful memory. Instead, Jake feels like he did something special for his grandma, and he gained confidence in the kitchen. He practiced reading a recipe, and he practiced fractions and measurements. I’m glad he wanted to do this, and I know his grandma enjoyed the cake! These things are worth all the mess in the world! Happy birthday, Billie! We love you!